Over the past 16 years, John and Veronica Johnson have been slowly working away on their 10 acre rural property. Over the past 16 years, John and Veronica Johnson have been slowly working away on their 10 acre rural property. They have two horses, laying hens and geothermal energy. They recently planted edible nut trees. With two young children in tow, the Johnson’s keep busy but they say they’ve loved moving to Caledon from Toronto. Footsteps from their home, the Johnson’s have a small pond which over the years has been a source of fascination and enjoyment. Recently, however, they’ve noticed more and more green algae and shallower water depth. 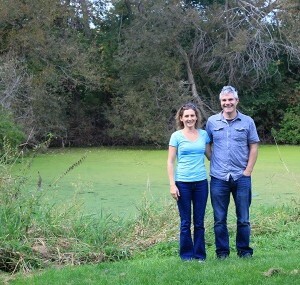 “We used to have so much wildlife in the pond – turtles, muskrat, fish and bugs,” say the Johnson’s. “But these days we hardly see anything”. They tried to fix the situation by installing a fountain to circulate the water, adding much needed oxygen, but the pond became so shallow over time that the motor on the pump stopped running. The Johnson’s have an online pond. It’s connected to a stream that runs through their property. The stream flows into the pond at one end and then exits at another, continuing downstream. Realizing they needed to do something if they wanted to restore the health of their pond and start enjoying wildlife again, the Johnson’s approached a contractor about having the pond dug out. Being on the Niagara Escarpment, the contractor advised them they should first speak to the Niagara Escarpment Commission (NEC). The NEC connected them with Credit Valley Conservation (CVC). The Johnson’s could have viewed this experience as “getting the run around”. When they met Sherwin Watson-Leung and his aquatic restoration team, however, they were impressed. They decided to work with CVC to restore their pond and take it “off-line” by removing it from the stream. The Johnson’s understand that by taking their pond off-line they will have a positive impact on the health of the stream that winds through their property. Online ponds can warm stream water by three to five degrees, the difference between suitable and unsuitable habitat for cold water fish. Online ponds also tend to accumulate sediment and pollution that runs off from surrounding land. When water exits an online pond, it can negatively impact water quality and water temperatures downstream. It’s been several years in the making, but construction on the Johnson’s restoration project began during the winter of 2015. With assistance from CVC and private contractors, and funding from the Ontario Community Environment Fund, the Great Lakes Guardian Community Fund and Halton Peel Woodlands and Wildlife Stewardship, the Johnson’s will take their pond off-line by building a new stream around their pond. The new stream will resume its natural path in a narrow, vegetation-lined channel, as it would have done before their pond was dug out in the 1960s. The Johnson’s won’t have to give up their pond either. It will be dug out slightly and remain fed by groundwater and seasonal high water flow from the stream. In future, the Johnson’s will be able to enjoy the wildlife the pond attracts without impacting downstream water quality and aquatic habitat. Data and information released from Credit Valley Conservation (CVC) are provided on an 'AS IS' basis, without warranty of any kind, including without limitation the warranties of merchantability, fitness for a particular purpose and non-infringement. Availability of this data and information does not constitute scientific publication. Data and/or information may contain errors or be incomplete. CVC and its employees make no representation or warranty, express or implied, including without limitation any warranties of merchantability or fitness for a particular purpose or warranties as to the identity or ownership of data or information, the quality, accuracy or completeness of data or information, or that the use of such data or information will not infringe any patent, intellectual property or proprietary rights of any party. CVC shall not be liable for any claim for any loss, harm, illness or other damage or injury arising from access to or use of data or information, including without limitation any direct, indirect, incidental, exemplary, special or consequential damages, even if advised of the possibility of such damages. In accordance with scientific standards, appropriate acknowledgment of CVC should be made in any publications or other disclosures concerning data or information made available by CVC.